You know, the older this pup gets, the easier this weekly photo thing is to pull off. This week, not only can we offer up the lovely over-the-shoulder look above, but we gotcha a bonus shot of her hind side with a jaunty profile pose. Oh, and this next one because it made me laugh. Holly, did you see where Jager got off to? No, but I’ll keep an ear out for him. Thanks for dropping by Talent Hounds! 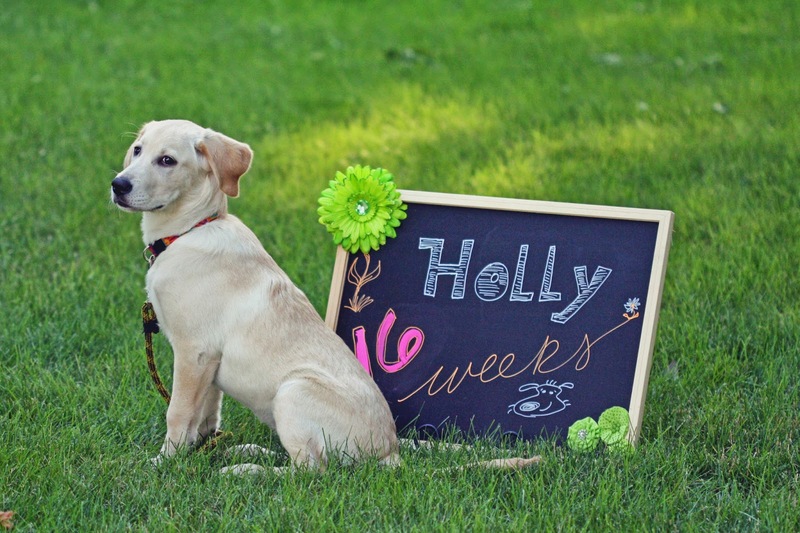 We got more Holly adventures coming up. She is so darling. That last photo is priceless. Why didn't I think to do something that crafty as my pups were growing?! Thanks for stopping by, Bailey. Happy WW to you! I wish I could be so creative as to come up with this stuff on my own. 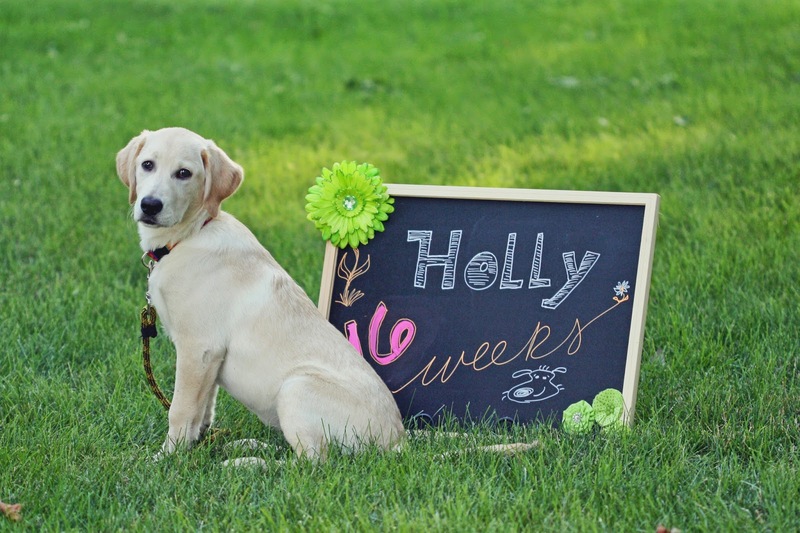 For this idea, I was inspired by other puppy raisers who were posting their blackboard photos on FB. What's really great about doing a series like this, is sharing the photos later when the dog graduates as an assistance dog. We can put these in a photo book for her new partner. Priceless stuff, that. I wish I'd started this with the other pups we've raised. Um, yeah, and maybe my kid too. Sure, lots of photos, but I'm liking this structured timeline thing. 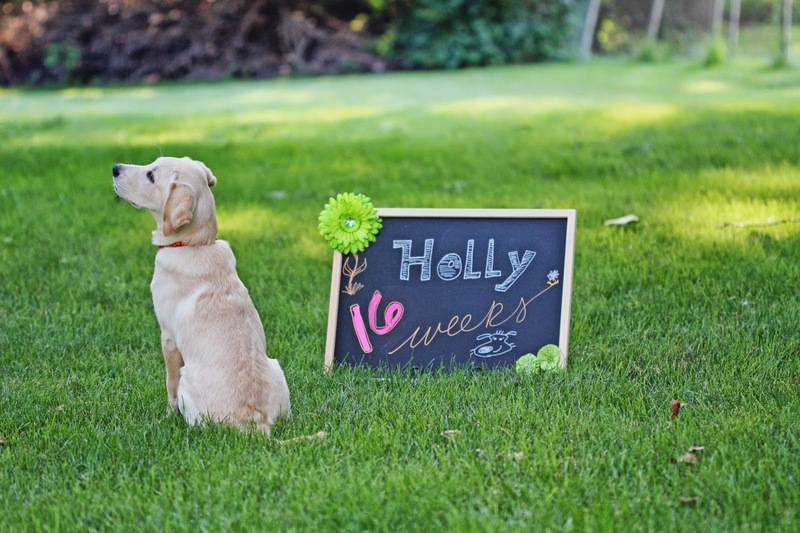 My first thought was to take the photo in the same spot in the yard with the pup in pretty much the same pose. That didn't last long, lol. Now I'm just hoping to be able to keep up with the weekly shoot.